Middlebury, VT— On September 13 the Middlebury College Museum of Art opens China Modern: Designing 20th Century Popular Culture, an in depth exploration of 20th century Chinese advertising images, mass media, graphic and product design that demonstrate how political ideologies and cultural values are transmitted through everyday objects. The more than 170 objects in this exhibition establish the preeminence of two contrasting 20thcentury ideologies in China—Capitalism and Communism. The exhibition demonstrates that despite their differences the means of conveying these values was often strikingly similar. The graphic design of the objects in China Modern include lychee and cigarette packaging, children’s toys, a multitude of product labels and advertisements, and propaganda from the rule of Mao Zedong. Beautifully executed woodblock prints and lithographs showcase the high-quality craftsmanship of Chinese print designers and artisans at work through these turbulent decades. The radical, systemic changes in 20thcentury China are dramatic. At the end of the 19th century, two thousand years of Imperial rule was disintegrating. Replaced by a short-lived Republic led by Sun Yat-sen in 1912, the following decades witnessed conflicts between a newly founded Communist party and the Nationalists. The Chinese Soviet Republic declared in 1931 was soon opposed by the Army of the Republic, the Nationalists, under Chiang Kai-shek. A relatively new city, Shanghai, became the most important port in Asia in this decade, dominating Chinese products and commerce. Japanese aggression into China during World War II forged a fragile, temporary rapprochement between the Nationalists and the Communists. It ended with the flight of the Nationalists to Taiwan and Mao Zedong’s proclamation of the People’s Republic of China, with Beijing as its capitol at Tiananmen Square, on October 1st, 1949. Economic reforms spearheaded by Deng Xiaoping after the death of Mao Zedong in 1976 again dramatically re-shaped China. Political changes continued to affect life in Shanghai and Beijing, as the forces of urbanization and modernization surpassed the rural reforms of earlier decades. The exhibition China Modern is divided into four sections, spanning the late Qing Dynasty to the present day. “A Graphic Tradition: Popular Design from Late Qing to the Early Republic,” serves as a prologue to the exhibition, introducing China’s graphic art traditions and featuring New Year Day prints and imagery of household gods. Of special note are several woodblock prints from the late 1800s that illustrate Chinese mythology and folklore. By looking at the roots of graphic culture in the first quarter of the 20th century, visitors will gain an appreciation for both the rich customs of the past and the burgeoning innovation which appeared between 1925 and 1949. “Cosmopolitan Capitalism: Shanghai under the Republic” looks at a range of materials from product packaging to film advertisements that illustrate the commercial vitality of pre-Revolutionary China in its heyday. These objects reflect Shanghai’s international position and the recent introduction to modern China of Western visual culture and values. “A Revolution in Culture: Designing the People’s Republic”focuses on household goods, advertising, and propaganda materials brought about by Mao. These objects reflect a significant cultural shift from earlier eras. The images provide powerful, persuasive messages that incorporate the tenets of the Communist Revolution and the new ideology of Maoism. They were aimed at the Chinese population in its entirety, but particularly at the vast numbers of rural and urban illiterate people. The exhibition culminates with “The Aesthetics of Nostalgia,”which demonstrates the ongoing impact of earlier embodiments of Chinese graphic culture today. 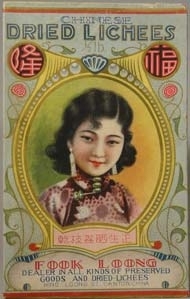 Shepard Fairey’s use of iconic Mao images in his work, or 21st century product packaging featuring recycled images of 1930s Shanghai beauties demonstrate the lasting impact of earlier aesthetic eras. China Modern was inspired by Reed Darmon’s Made in China (2004, Chronicle Books), whose collection of Chinese cultural artifacts is the backbone of the exhibition. It was co-curated by Kalim Winata, an independent scholar and video artist specializing in print and popular cultures of the 20th century, with a focus on Asia. China Modern was developed by the Pacific Asia Museum, Pasadena, California, one of only four U.S. institutions dedicated to the arts and culture of Asia and the Pacific Islands with a mission to further intercultural understanding through the arts of Asia and the Pacific Islands. The exhibit’s tour was organized by International Arts & Artists, Washington, DC, a non-profit arts service organization dedicated to increasing cross-cultural understanding and exposure to the arts internationally, through exhibitions, programs and services to artists, arts institutions and the public. Its installation at Middlebury is supported by the Christian A. Johnson Memorial Foundation.